Octieve San is an elderly Breton citizen living in Solitude, frequently found in the Winking Skeever. He lives with his daughter, Evette San, in her house. He is often critical of his own age, and he drinks and gambles heavily. 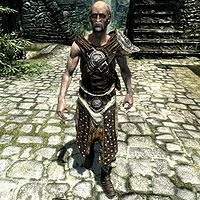 Upon chatting with him he may complain about gambling debts owed to Irnskar Ironhand, which you can assist him with in exchange for a free Two-handed skill boost. He will also start to like you, and becomes a potential candidate for marriage. When you visit Solitude for the first time, Octieve will be one of the spectators of Roggvir's execution. After this, he will assume his normal schedule: upon waking up at 6am, he starts his day with a trip to the Temple of the Divines to pray there. At noon, he goes to the Winking Skeever and enjoys a six-hour meal until 6pm, then heads outside to carouse in front of the inn. He returns home at 2am to sleep. Octieve wears a set of studded armor and a pair of hide boots. He wields an iron dagger and carries a belted tunic, the key to his daughter's house, and a selection of common items and gold. Greeting him will have him tell you, "Being old's not so bad. Daughter keeps me fed, and my working days are done. ", and "I'm too old to work, but that don't make me too old to drink." He may offer you the reason for his heavy drinking: "You want to know the one truth I've learned in all my years? Life's too hard to face sober." If you have not talked to Irnskar yet, Octieve will say, "Take my advice. Never gamble. Damn Irnskar has me in debt up to the eyes." He may try to shoo you instead: "You got nothin' better to do than bother an old man?" If Evette is alive, he will point you to her: "You should speak to my daughter, Evette. She's the brains of the family." When you bid farewell with him, he will say, "Always good talking to you... friend." You can ask him if he is in debt with Irnskar, and he will reply, "Too many drinking games, too many bets, and I'm too old to ever raise the coin on my own." Offering to talk to Irnskar will have him comment, "He's a stubborn oaf. I don't know what good it'll do." If you instead say that you're sorry to hear that, he will say, "I'm sure. I'm sure." Once Irnskar has agreed to forgive Octieve's debt, inform him of the good news and he will say, "You've done a fine thing for me. You know, I used to be quite a warrior in my day. Let me show you a thing or two." as he awards you with a one-point increase in your Two-handed skill. Should you meet Evette San, and Octieve is alive, she may advise you to avoid him: "If you see my father Octieve around, stay clear. He'll only ask you for money or mead." Ask her about her spiced wine's secret recipe and she will mention him again: "Oh, yes. A secret family recipe. The only good thing my father Octieve ever did. In fact, it's so good, no one else in Skyrim even tries to make any." Evette: "Father, could you clean up the house a little while I'm away?" Octieve: "Maybe. I'll see if I feel like it." Evette: "I'm on my feet all day. Can you please do this one thing for me?" Octieve: "Where've you been all day?" Evette: "At the market, father." Octieve: "Well, did you bring back any mead?" Evette: "I barely make enough for us to eat as it is, father. You can't just drink it all away." Octieve: "Humph. Some daughter you are." This page was last modified on 15 June 2014, at 20:48.